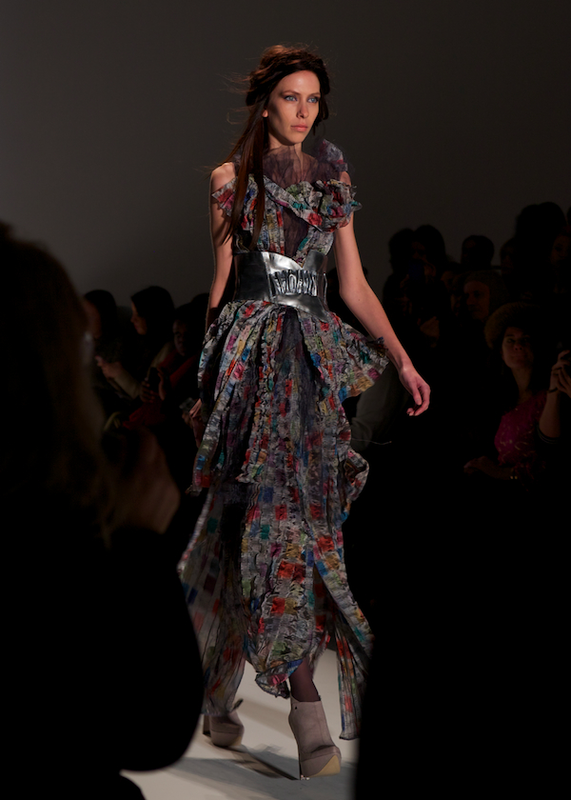 Katya Leonovich opened with elegant paintbrush swirls of blue that reminded me of Asian artwork from 20th century. I noted quite a few monochrome looks that were big on the use of textures. 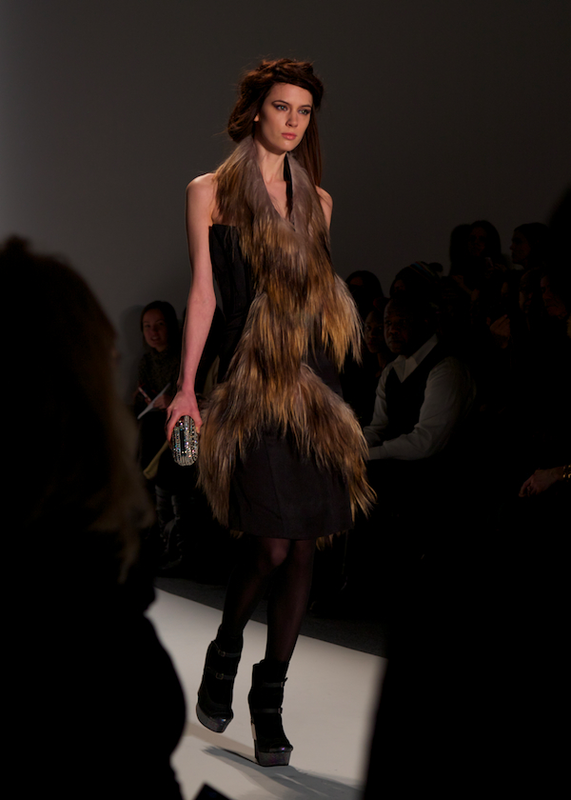 Leather and fur were also sprinkled throughout the collection. I personally didn't love the fur and leather looks, but I think they could be great on the right person. Metallic accents were used liberally with some models carrying sparkly or shiny chrome minaudieres and some wearing interestingly shaped corset-style belts. I was surprised to see so much use of large ruffles and ruching. Surprisingly I liked it, especially on the long dresses. The hair and makeup also fit the look of the collection perfectly. I couldn't imagine anything else but the messy crown of braids on top of pin straight, wispy ends. What were your thoughts on this collections? Thank you again to Alex for covering another NYFW show for Fashionista NY Girl! I must say not only am I loving the pictures (what amazing shots right?!) but I'm actually sort of liking this collection. To be honest, I wasn't a total fan of Katya Leonovich's Spring 2013 collection. I thought the cuts and colors were pretty, but her prints were maybe to dark for me, they were body sculpted prints...and her twin Obama dresses as her ending walk left me wondering what I had just saw. To me this collection is angled towards a more consumer friendly line, but keeping her artistry intact. My favorite part of this collection is definitely the textures and patterns!!! The last outfit is stunning.